Transylvania (the land “beyond the forest”), is often known best through Bram Stokers ‘Dracula’ and Patrick Fermors ‘Castles of Transylvania’ and is one of the great cultural landscapes of Europe, while yet still relatively undiscovered. With our planned route, you will cycle along the spectacular Carpathian Mountains with splendid views, the lowland valleys with its medieval looking villages left untouched by time, and lush forests which shelter the local deer, boars and even the more reclusive bears and wolves. On some of the days, you meet only lone oxen drawn carts, occasional horseback riders and cross paths with herds of driven cows or find buffalo cooling off in the rivers. You may visit some of the numerous German/Saxon church castles along the way, with their beautiful Renaissance and Baroque altars and pulpits. In most cases, you have to get the keys from a nearby farmhouse! You will see the castles of Bran, Sighisoara (UNESCO Cultural Heritage) and Fagaras as well as the very beautiful medieval Saxon towns of Brasov and Sibiu the ‘Cultural Capital of Europe 2007’. Accommodations with private facilities, 7 breakfasts, 5 dinners, transfers during the tour as described, English speaking cycling guide, Private taxi or minibus transfers between Bucharest airport and the first and last hotels, Entrance tickets. Accommodations with private facilities, 7 breakfasts, transfers during the tour as described, route notes and maps, contact on ground. Transfers from/to Bucharest Airport included in the guided option. There are good train connections from Bucharest to Brasov (nearly every hour) and then back from Sibiu to Bucharest. Self guided tour is available any day from April 27th to October 9th. Stroll around the beautiful town square, surrounded by Gothic, Renaissance and Baroque patrician buildings. Visit the gothic ‘Black church’ with the world famous Buchholz organ and a rare collection of oriental carpets which Brasovian tradesmen brought back from their trading missions in the Ottoman Empire. In the evening, you may attend an organ concert and have dinner on the historic square. Transfer to Zarnesti. 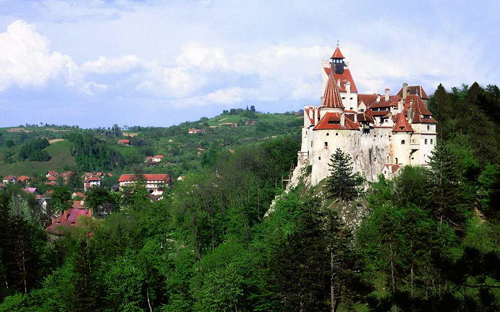 Cycle to the Dracula Castle with splendid views of the Bucegi Mountains. It served as an impressive backstage for Roman Polanskis ‘Dance of the Vampires’ and for Queen Mary of Romania, a granddaughter of Queen Victoria, as salon and refuge. Cycle to Rasnov castle, where you have marvelous views to the Postavarul and Piatra Craiului mountains. Cycle through the Piatra Craiului National Park, which has the highest concentration of bears and wolves in Europe, along a beautiful forest valley between two mountains. Then you cycle with spectacular views to the ‘Transylvanian Alps’ through to former Walachian territory (‘terra Vlachorum’) to Fagaras. On your way, there should be many opportunities to see rare flowers birds and butterflies. Visit the pretty, recently restored Renaissance castle (and its museum) owned by the Hungarian Voivodes who ruled Transylvania. Short transfer to Cincu or Dealu Frumos to avoid a busy road. Today you cycle through quite a remote area passing numerous villages and fortified churches. You may see a street wedding on your way: German Blasmusik with Romanian texts and Gypsy tunes. Very pretty is Trappold (Apoldu) castle guarded by a German artist. The town castle of Sighisoara is the biggest lived-in castle in Europe and part of the UNESCO Cultural Heritage. Have a good Hungarian meal (or maybe game) in the Casa cu Cerb, the ‘House with the Deer Antler’ where the Prince of Wales is dining sometimes when visiting Transylvania. Cycle to the old bishopric of Biertan, one of the most impressive castles of Transylvania (UNESCO Cultural Heritage). Today you cycle through the remote Harbach valley with beautiful views to the Transylvanian Alps. You meet horse wagons loaded with hay, and villages in which the time seems to stand still. The farmers on the fields are still using scythes and sickles. You may have a short detour to visit the Hosman castle with its interesting Gothic sculptures. See the ‘Speckturm’ (bacon tower), maybe the custodian will climb up with you the clock tower and you may have a look to its ancient mechanism. Today you will cycle to the Brukenthal summer residence and the impressive church castle of Cisnadie. Via Cisnadiora you reach the ‘Young Forest’ (visit the peasant museum). Then a cycling path will bring you traffic free through the ‘Alder Park’ straight to your hotel in Sibiu. Train/bus to Bucharest (guided tour: private minibus or taxi transfer to Bucharest airport included). Pace: The tour is mostly flat with a few hills in between. You cycle on quiet side roads and on some firm nature or horse wagon roads. 35-60km per day. Helmets are not available on this tour. We recommend that you bring your own for safety and hygiene purposes. Romania has a temperate climate with 4 distinct seasons. May, June, September and October are the best months to visit. Summers are generally hot. However, refreshing rainfalls can be expected. Due to the continental influences from the East, the summers can sometimes be dry with rain in the mountains only. Autumn is usually cool and pleasant. Strong winds and storms are rare in the summer, they tend to occur in the mountains during late autumn. Winters are usually cold, with snow falling throughout most of the country. Spring can see some rainfall, but it is generally pleasant with temperatures getting warmer. Annual rainfall all over the country is 677 mm, 1000 mm in the mountains. Note: You should have your luggage packed and ready to be transported by 9.30 in the morning. You will be supplied with a front bag with a transparent waterproof pocket where you can keep your maps and route notes for the day (it can be attached on the handlebars), saddle bags, repair kit and one spare tube per bike. If one hotel from the list below is not available at the date of the booking, we are using similar hotels (same standards). The Ibis Gara de Nord offers comfortable rooms with Wi-Fi wireless internet access, air conditioning, a minibar, LCD TVs and en-suite bathrooms with a shower and a hairdryer. The hotel was opened in 1937 in a 6-story neoclassical building and was renovated in 2008. It offers 91 rooms that are cozy and Italian in design, and feature Wi-Fi, a private bathroom, a safe, TV, a fireplace and IDD phone. Cabana Putna Dorina is set in Putna and offers a restaurant, a bar, and a garden with a terrace. WiFi is available in some rooms. All units come with a balcony, a seating area, and a cable TV. Featuring a shower, the private bathrooms also come with bathrobes and free toiletries. The building is surrounded on two sides by a beautiful wooden porch, covered with wooden tiles where, during the summer you can admire the gorgeous landscape while having a delicious meal. The terrace as well as the yard is full of beautiful flowers. In the afternoon, after 5,30 PM, you can hear from the monastery the "toaca" (a nun is hammering on a board) and the sound of the bells calling the nuns to the evening prayer, and, possibly, this will take your thoughts to the glorious times when the monastery was gathering around the entire village. Passiflora is located in the heart of Bucovina, a few minutes' walk from the Humor Monastery (UNESCO World Heritage Site). The guest house combines comfort and traditional Romanian style architecture. Each room has its own bathroom and is equipped with a minibar, telephone with international access, cable TV, internet access and a balcony. Just 30 m from Bran Castle, this guest house in Bran offers a pretty terrace and country-style rooms. The Pension Ana Bran has brightly decorated rooms with TV and private bathroom. Free Wi-Fi is provided in all public areas. Pension Nea Marin offers a garden, free WiFi, a shared kitchen, and a shared lounge. The bed and breakfast features mountain views and all rooms have their own bathroom. In the foothills of Piatra Craiului Mountains, between Piatra Craiului National Park and Zărnești, Pensiunea Hora cu Brazi offers free Wi-Fi, and a Romanian restaurant. All rooms have a balcony with views of the surroundings. A seating area, flat-screen TV with cable channels and a bathroom with free toiletries and a hairdryer are provided in each room. 8 breakfast and 6 evening meals are included in this trip. The breakfasts are eaten at the accommodations and included evening meals are taken in either the restaurant (if it's a hotel) or in the dining room (if it's a pension). The style of the food is mainly Romanian. Vegetarians, gluten/lactose free, etc… can be catered for when notified in advance. -We provide bike tool kit, repair supplies, pump, lock and spare tire tube. (b) 2. nationals of Australia, Canada and the USA for touristic stays of up to three months.